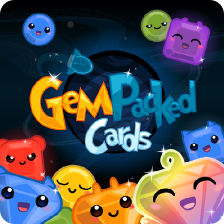 GemPacked Cards is a light card game for two to five players, ages six and up, and takes about twenty to thirty minutes to play. 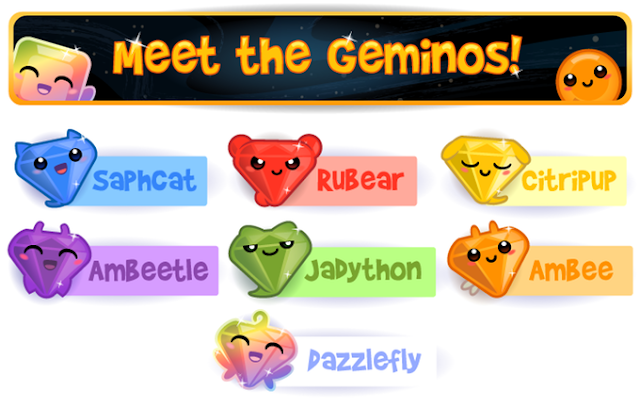 The object of GemPacked Cards is to collect different colored Gemino Pips in order to trade for Gemino Squares which are used to trade for Gemino Diamonds. Players can also trade Pips, Squares, and Diamonds for Rockets, Suns, Red Dwarfs, and Novas. 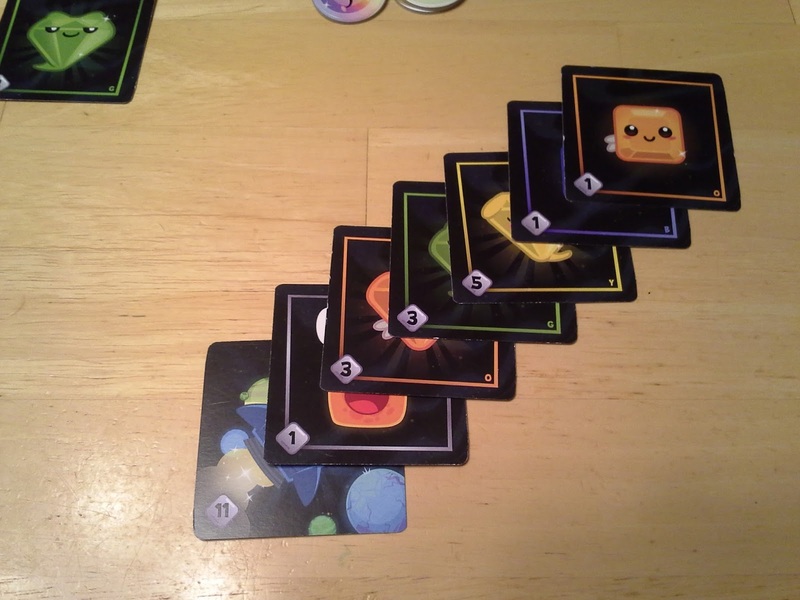 Each of these different cards are worth different victory points and the player with the most points at the end of the game wins. Sounds simple right? Setup for a two player game. 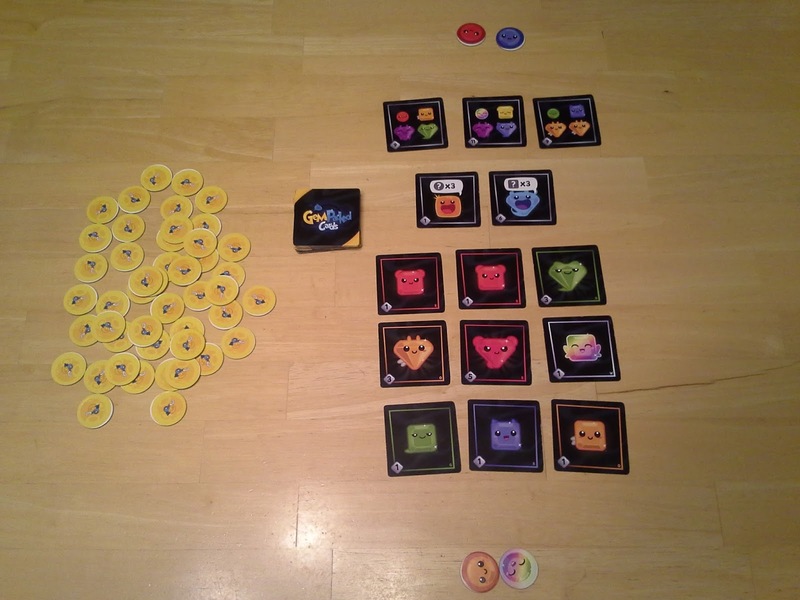 Set up for the game is very easy once all the components are separated out and only takes a few minutes. Learning and teaching the game is a breeze as the rule book is only ten pages on half page sheets and very straight forward (which isn’t easily accomplished with rule books). You can view the rule book HERE. 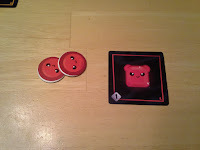 On a player’s turn she will draw two Pips from the draw pile then perform as many actions as she can. Actions include trading Pips for Squares, Squares for Diamonds, or a multitude of combinations to get Rockets, Suns, Red Dwarfs, and Novas. Players may also trade down from Squares back to Pips which comes in handy if you see a better combo on the table. Lastley players may choose to take no action in order to draw an additional Pip. Once a player’s turn is over the center playing field is refreshed from the draw deck and play continues with the next player. If at any time a Meteor or Comet is added to the center playing field play stops and those cards are resolved. 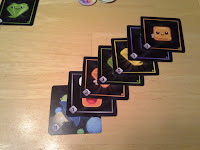 Meteors allow players to draw additional Pips from the discard pile, while Comets destroy cards in the field around them that must be replaced. 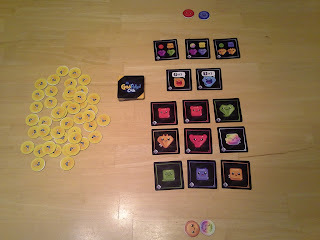 Play continues until all the Pips have been taken from the draw pile at which time each player gets one last turn. Players then add up the points on all Squares, Diamonds, Rockets, Suns, Red Dwarfs, and Novas in their hand and the player with the most points wins! 25 points - I win! 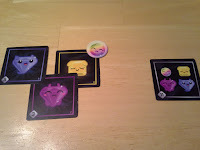 GemPacked Cards is a blast! 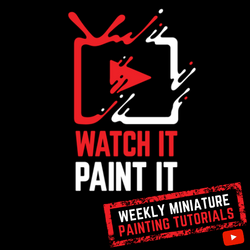 As I mentioned above it is quick to setup, and easy to learn and easy to teach. 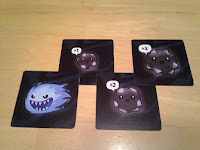 The game plays quickly which makes it an ideal filler game, but can also be played in rounds to make a longer game. 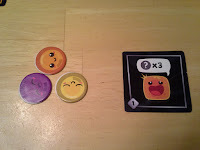 the game also scales from two to five players with the addition of more Pips and cards. Katherine Waddell did a fantastic job with the artwork which appeals to a wide range of gamers and makes you feel like you are playing a mobile game similar to Bejeweled. Eduardo Baraf used a simple mechanic - set collecting - to created a game that has a unique feel that I haven’t seen before. Game play is simple but thoughtful as you consider all the possible combinations. I enjoy how in the beginning of the game choosing combinations is mostly straightforward, and then in the last few rounds you burn some serious brain cells trying to maximize your points. Dad - I really enjoy this game and can see it hitting the table a lot, especially when we have a few minutes between other activities or games. Mom - I like any game that teaches while being fun. GemPacked Cards is a great introduction to the Color Wheel for the kids while being a good reminder for the adults. I don’t know how many times the Ziploc commercial ran through my head “Yellow and Blue make Green”! Boys (ages 3, 6 and 9) - Loved the artwork and enjoyed working on getting combinations which allowed them to get bigger and better cards. Disclaimer the three year-old needed to be helped but loved the pictures and holding the Pips. 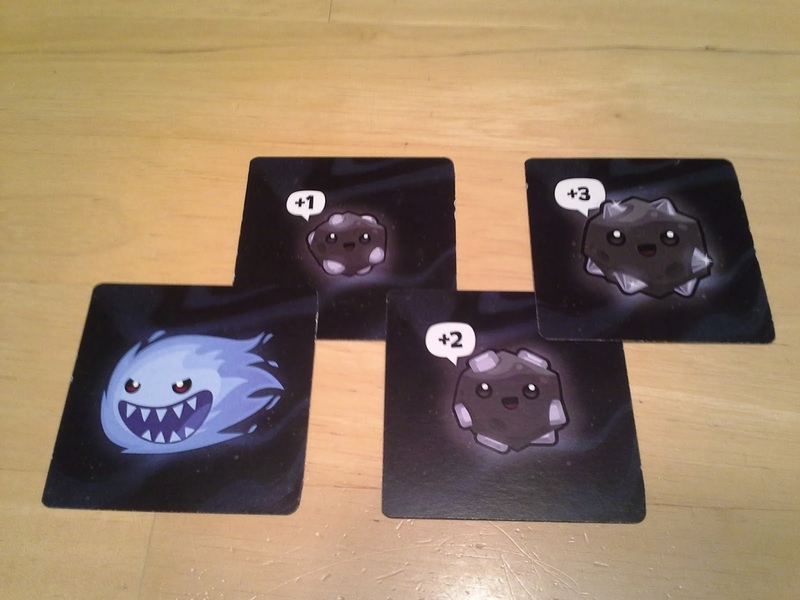 Overall GemPacked Cards is a perfect fit for a family of gamers or a gaming group looking for something to start the game night out or to fill in throughout. 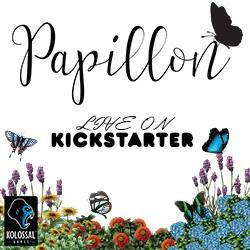 If this sounds like a game you would enjoy you can support Pencil First Games and purchase your advanced copy on Kickstarter.com, but don't wait the campaign ends September 22, 2015. 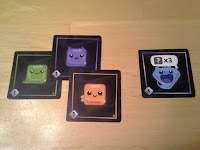 GemPacked Cards on Board Game Geek. 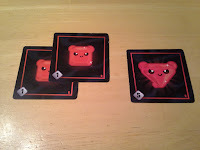 GemPacked Cards on the Web.